To a thief, a broken window is an open door to the valuables locked inside. Your electronics, jewelry, merchandise and other costly possessions can all be gone in a matter of minutes after a criminal gains entry. Luckily, Armorcoat safety window films help eliminate a burglar’s easiest access route - a broken window. By making a window more difficult to shatter and holding the broken glass firmly within the window frame after breaking, illegal access is much more difficult and less likely to occur. The FBI’s Unified Crime Report states that almost 70 percent of all burglaries involve forced entry through a window or door. Armorcoat's safety film helps deter break-ins, theft and even personal injury. 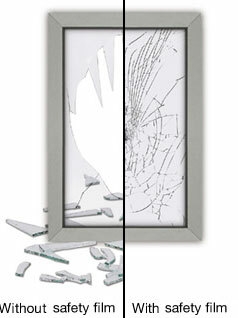 Safety Window Film Provides The Best Defense From The Dangers Of Broken Glass. Safety and Security Window films are made with layers of polyester film bonded by special adhesives. Easily installed to the interior of new glass or existing glass, the film forms an almost invisible shield that holds glass shards intact when a pane breaks. This can effectively reduce the flying glass-related injuries. Various levels of film protection are available to address various hazard levels. DID YOU KNOW that much of the destruction resulting from flying glass shards can be controlled—even prevented—in residential, corporate and retail buildings. 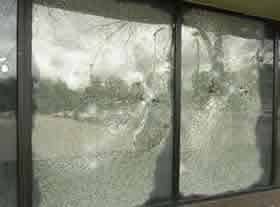 Safety and Security films help hold glass in place upon impact, offering 24-hour window protection against intruders, severe storms, terrorists, and earthquakes and bomb blasts. This resilient security film improves window safety for homes, businesses and government properties worldwide. Armrcoat gives a choice between clear or a high performance solar control window films, both offering 99% UV protection and up to 80% of the total solar energy rejection, to ensure more efficient cooling in summer and heating in the winter. Providing significant cost savings for you by reducing your energy expenditures and operating costs every month. From homes and small storefronts to expansive high rises and safety-intensive government agencies, every building is better protected with Armorcoat safety window films. Panorama/Armorcoat can also protect information theft with EMI Shielding.